Following the incredible success of the Apex Intense and Apex Devotion Apex have decided to bring out a new product. The Apex Oakland. This stunning hang on the wall electric fire features the innovative and energy saving LED flame effect employed on the Intense and Devotion, combining with the flat black glass fascia to create a very contemporary and modern feel. Ideal for that minimalist feel. 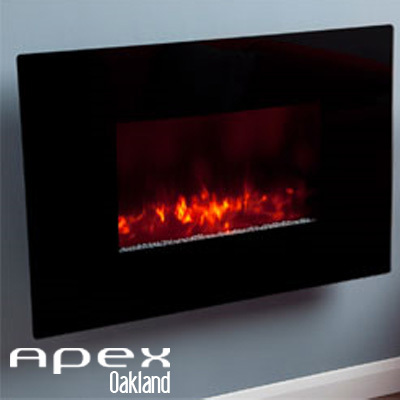 Offering a 2Kw heat output, the Oakland is ideal to quickly take the cold edge off of almost any sized room. The unique LED flame effect can be dimmed to one of three settings, for that subtle feel or to truly give the impression of a roaring fire. The white stone fuel effect adds a further contemporary feel and a thermostatic control means that the temperature can be set and maintained without even having to leave the comfort of your chair. Dying To Know Where The Nearest Pub Is?